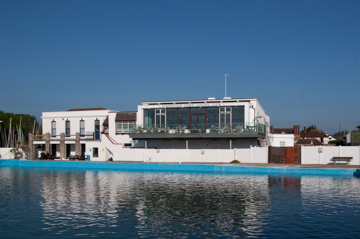 The Lymington Society has been concerned for some time that the unique charm and historic settings of the Lymington Sea Water baths could be under threat from some of the more ambitious schemes that were being debated around the town. Whilst appreciating that the maintenance of the baths and their safe operation had become increasingly problematic in this more safety conscious era, we were concerned that the rumoured redevelopment proposals could threaten the future of the baths as many have known and loved them for generations. We made enquires several months ago with English Heritage as to how the Society could take forward the listing of the baths. We found that a request had already been made to English Heritage and that rather than reject this application they had produced an in-depth report on the history and significance of the baths. We were pleased to add our support to the original request from a member of the public for listing to be granted. We felt that in view of English Heritage’s findings concerning the great historic importance of the baths that they would be more likely than not to agree to the listing. Now that English Heritage has completed their assessment and has decided to list the baths we are very pleased and fully support their decision which may be the key to the baths long term retention and improvement. Whilst understanding that this decision may be viewed by some as making necessary redevelopment of the baths more difficult, we sincerely hope that the listing of the baths will now in fact make it easier to obtain the vital funds that the bath need in order to guarantee their long term future. We hope that the authorities will understand that despite the listing, some sympathetic development of the baths and the area around them may well still be needed to give them a long term future.